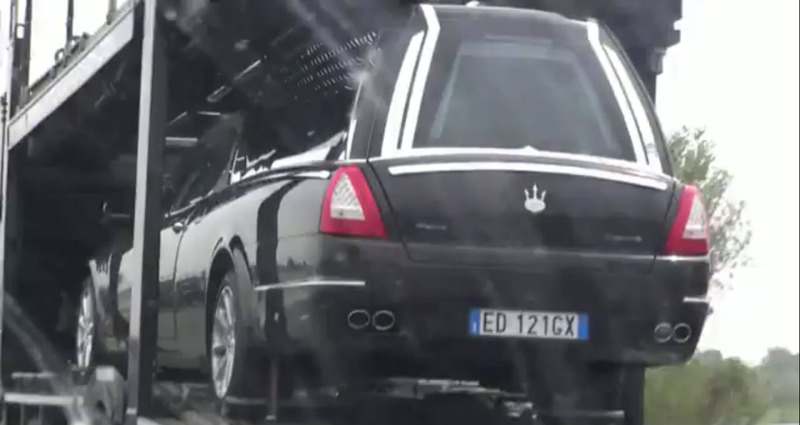 Since we’re all kinds of excited for SEMA tomorrow, we thought we’d convey a little bit of that excitement with some general awesomeness – like the awesomeness of a Maserati Quattroporte hearse…yeah! That will top off any car guy’s bucket list as he departs terra firma! Heck yes! As far as we can tell, there’s a Ferrari 458, a McLaren SLR, a Lambo Gallardo, a Roller, and a Porsche 911. We’re excited to hopefully meet the USA presenters, as well as take a ride in those exotics (anywhere will do, and don’t pay attention to the meter). Of course those last two will likely only happen in our dreams. It’s one of those publicity stunts that we don’t mind. Not sure whose fault this one is – it looks like the motorcyclist is going pretty dang fast, but he is sure a ninja when it comes to flipping it. NINJA WIN! Anonymous on November 2, 2010 at 3:57 am. Awesome. That Top Gear USA display is going to be wicked cool. nnWhat the heck is “a Roller”?